I found a piece of my EdPuzzle! The biggest challenge I had in creating this was simply the time to sit and play with the tool – starting from scratch with a video was not an option for me this week. 3 Way Conferences, a full PD day, and a full weekend of coaching left me very little time to play around to any extent. If this is an issue for you as well, fear not! There are a vast array of videos that are ready to use on the EdPuzzle site with some of the work already done. I accessed a copy of the video I wanted to use which already had questions developed from another user. Then I previewed the video, cropped it for time and relevance, changed the questions to better suit my students’ needs, and DONE! Ready to use viewing activity for my classroom. Since I am not currently teaching a regular ELA 20 class until next semester, where I would use this video as a pre-teaching tool or formative assessment, I decided to test out the video on my Pre-AP ELA 20 students. The students appreciated that they could access the video themselves and answer the questions at their own pace. I used the video as a stand-alone activity for my Pre-AP class but many of them were able to draw connections to characters in some of the literature we are reading. This EdPuzzle Review states that “while it will meet many needs, Edpuzzle could use more features to annotate and remix videos, especially the ability to combine multiple videos.” Regardless of this deficit, I found this tool simple and easy to use while still being effective for engaging my students. Many of the viewing assignments I’ve used thus far in my career are a bit lackluster to say the least. They only required lower-level thinking skills. EdPuzzle gives me options to encourage interaction with the video which increases the desire to learn the material. Adding supplemental resources and links would further enhance this. Students can also use EdPuzzle to research, create, and share their own video lessons – it could prove very useful for them as a learning tool. EdPuzzle is a tool that I will continue to use — check it out and see for yourself how fun and easy it is to create interesting and engaging content for your students! 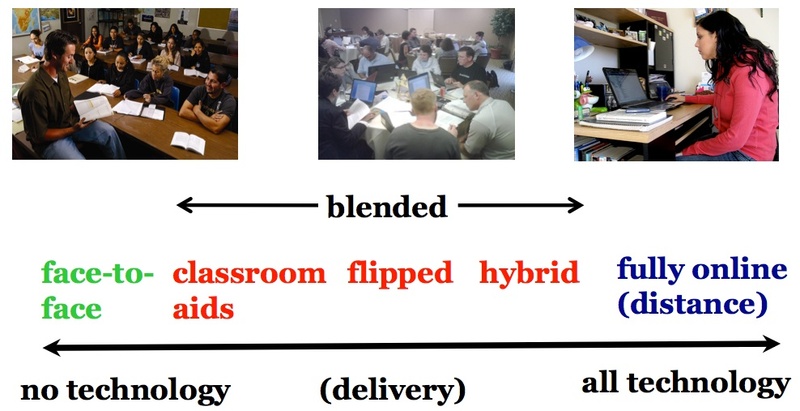 Online/Blended – could it be the future? Living and working in Weyburn, a good hour away from the University of Regina where I am enrolled in Graduate studies, is a challenge. On campus classes in the evening require that I leave home by 4:00pm to travel to the city (encountering traffic and wildlife along the way), sit in class for 3 hours or so, and then drive home – roughly seven hours of time for one class. This takes a toll on the mind and body. Not to mention that I hate winter driving … and Saskatchewan seems to have 8 months of winter every year. Not an ideal way to motivate me to attend classes in person. Enter web-based classes! Online/blended learning has been a surprisingly fantastic experience, despite me being a tech dinosaur. Tech usage may not come easy to me, but the benefits of learning in this type of environment are far more positive than negative. Despite my lack of experience with and knowledge of technology, my online/blended classes have been fantastic for a variety of reasons. “Flexibility of online learning is clearly of great value to many mature adults trying to balance work, family, and study requirements” (Appana, 2008). My classmate Scott pointed out in his blog this week that online learning is very beneficial to him as a busy dad, and I agree – as a mom/wife/teacher/coach whose schedule is packed, learning from the comfort of my home and eliminating the commute to an evening class saves me invaluable time. I use that time to work on class readings or to collaborate with my classmates on group projects using a variety of online resources. Or to do laundry. You know – fun stuff like that! My first hybrid online/blended class last semester was a huge learning curve, made easier by the communication and support from Alec and my classmates. I wish all of the grad classes were offered in this manner as it would make my life less stressful. However, I know that not everyone feels the same. This type of learning environment may work very well at a graduate level, but for my elementary teacher friends, it would probably not be as effective. My classmate Brooke talks about her struggle with this in her blog for this week. I agree that face to face interactions are vital for young students, but have been thinking quite a bit lately about how a more blended approach could be utilized in my high school ELA classes. I currently have three students who have a variety of medical challenges and are missing quite a few classes while they deal with their situations. Blended learning would greatly increase their chances of finishing their courses on time and obtaining their ELA credits. The online delivery or environment would likely not be as much of a challenge for them as it has been for me since they are quite adept at the use of technology, and it would likely alleviate some of the stress that they feel for not being able to attend class on a regular basis. I have done my own version of “correspondence” courses for students in the last ten years. I have had students who have started at our school due to living in the community for hockey and then they transfer back to their home schools but want to finish my courses for a variety of reasons. This type of learning was made possible through the use of the internet and was supported by my admin team and by the students’ home schools. The students obtained their credits by communicating via web tools to “participate” in class, by sending me assignments electronically, and by attending some days in person (final presentations and final exams). Could we have done it better? Yes. Overall, though, it was a good learning experience for me and for the students. My experience with that and with taking Alec’s EC&I 832 and EC&I 833 has motivated me to take EC&I 834 next semester to learn more about designing online and blended learning environments. Digital libraries – though I love books and physical copies of resources, digital libraries have played a huge role in education for me over the last ten years. Being able to access online databases and libraries for educational research has saved me time and money. Partnerships & Professional Learning Communities – the collaborative experience when using the internet for learning has been key to my growth as an educator and as a grad student. From technical support to collaborating on projects to sharing our resources for teaching, the relationships that I’ve been able to foster have been beneficial to me in so many ways. I am very lucky to have an amazing group of colleagues in the ELA department in my school with whom to collaborate but am also blessed to have a larger group of professional colleagues online. Reaching out and discussing what is working for other educators in other parts of the province and across North America has been an incredible experience that I plan to continue. Blogs – I love writing. I truly do. Writing helps me to organize my thoughts and contribute to my own learning. Though I’ve never been really shy about sharing my opinion in traditional classroom settings, I do enjoy having time to think and organize my thoughts on a given topic before being required to respond. Developing a blog for my EC&I classes has been a great learning tool for me! I have many ideas for how to incorporate blogging into my high school ELA classroom because of these experiences. Microblogging – though I am not a huge fan of Twitter on my mobile device, I do appreciate and enjoy the quickness of the microblogging experience. Using Tweetdeck and other time-saving elements have made the experience more manageable for me. I can click on the articles that interest me, easily see what my classmates are viewing or reading from their posts, follow people and organizations who have content that is of concern or interest to me as an educator, and connect with a variety of people all over the world in a matter of seconds. There is value in microblogging as a tool for learning in my classroom as well, though I know that incorporating this would be more of a struggle for me than blogging, for instance. I would have to become more adept at the use of it myself before I would start introducing it to students. Social Networking – hands down, this is the way students communicate. An area of great interest to me as an educator is in how we can incorporate the use of social networking to enhance student learning. The power of connecting to others around the world could be of great benefit to students in the growth of their social responsibility, a concept embedded in our SK ELA curricula. Zoom – using Zoom for online meetings and classes has been a game changer! It saves time and money for organizations such as the provincial sport board I am on – we don’t have to pay for mileage to have meetings. It is a very valuable tool for online learning as classes can meet at a specified time to participate in class discussions. The ability to share screens, form break out rooms for small group discussion, and to record the sessions are great perks to using this online conferencing tool. Online sharing and collaboration – with tools such as Google docs and slides, working on projects or collaborating with classmates is very simple and effective. Autosave features are helpful and working in real time with others on collaborative projects is easy. Though it does have some limitations ( for example, I don’t like Google sheets due to some performance issues I’ve had with it in the past), the projects for which I’ve used Google docs and slides have all been good experiences. Though I don’t think I am ready to be an online educator full time, I can see the benefits of using blended learning for myself and my students. As an educator, I value the relationships that I am able to foster with my students in the classroom and I fear that I would not be as effective in fostering those same relationships online. Fear of change and doing new things can be crippling, but it can also be used to grow. Tackling the aspects of online/blended learning that cause me to feel apprehensive may take some work, but ultimately would be rewarding. Using some of the tools I’ve encountered, such as Zoom, could help me with this. Who knows? Maybe someday I will be required to teach in an online environment. I am thankful that I’ve been introduced to some of the tools that would help me make that shift and am even more grateful for the professional learning community that I’ve been able to foster as a result of my teaching career and my time in undergraduate and graduate courses, in person and online. Internet – Distraction or Necessity? It is no secret that I am a master procrastinator. I have the best of intentions to attack my workload in a timely fashion… and then I end up doing anything BUT what I am supposed to be doing. It is definitely true for me that the more “tabs” I have open, the less likely I am to finish any of the many tasks I need to accomplish. The internet can be a huge blessing as an educator, but it can also be a huge distraction. However, it is not the only distraction we have in our work days. Email, announcements that interrupt instructional time, supervision, extracurricular duties … sometimes it never seems to end. Often I wonder when the last time was that I felt truly relaxed and wasn’t thinking of the next thing on my To Do list or what to make for supper or if I remembered to change the laundry from the washing machine to the dryer. The internet or my use of “screen time” isn’t the only culprit here. More often than not, it is simply that I am trying to do too much without properly prioritizing my “need to do” and “want to do” lists. Kyla Ortman said in her blog this week that “perhaps people are hyper focused on all of ‘the things’ they need to accomplish while not being present in the moment.” I agree wholeheartedly! The video “Single-tasking is the New Multitasking” was a humorous take on this idea. The quote within the video “When workers don’t check email, they focus for longer periods on tasks and show less physiological signs of stress” stood out. This is true for me both at work and at home. It is one of the reasons I refuse to have my work email available on my smartphone and one of the reasons that I have set aside time in my day to check and respond to emails. Running a small business as well as being a teacher and a mom/wife means that I have multiple email addresses and To Do lists to stay on top of. Part of managing this workload is in creating balance. I truly can’t imagine what my daily life would look like without access to the internet. It truly does help me prepare better lessons, with videos to pique my students’ interest or an infographic to help explain a concept or a poem to project for the whole class to read without killing more trees by photocopying for each student. As Kyle Ottenbreit said in his blog this week, “technology is an incredible source of information that serves to capture the attention of our students. But technology is no substitute for a prepared teacher holding the attention of students. If we can create that level of engagement with our students, then the technological aspect only puts us over the top.” I think this is so very true. Can I teach without the internet? Yes. But do I have to? Power or internet outages happen but they don’t halt the teaching or learning process in my classroom. I think this is partly because I am “old school” and love physical copies of books and handouts… but also because I am fully prepared for each class and know my material. I was not as confident ten years ago when I was first starting my career and often relied on the internet to help me fact check, gather data, research, or connect with my support system of fellow educators. Though I have never relied on technology to teach my classes, I am very thankful that I have it as a tool in my back pocket! Gotta run now … it’s time to check my email. My well-documented technological woes are the bane of my existence as a teacher but I know how important it is to do my best to incorporate technology for the benefit of my students. When I discover or “finally” master an app or a program, I feel a huge sense of accomplishment. None of it comes easy for me. It’s a good reminder of what education is like for many of my students. This week we had a choice of activities and topics for our blog post, and though both were very tempting, I chose to explore some Chrome extensions. Out of the list of twelve, six of them really interested me. Here’s a bit of my exploration and insight in no particular order. Grammarly is hands down one of the first extensions I can say I wish my students and colleagues used on a regular basis. It helps with every single thing that the user types … emails, letters, essays, and other documents can be both spelled correctly and grammatically sound! Glory hallelujah! If more of my students and colleagues used this extension, my eye twitch would probably get a whole lot less pronounced. I began using Grammarly a few years ago and I will admit that it has caught more than a few grammatical errors in my writing! In our fast-paced world it is so very easy to make mistakes while we are typing and we often hit send before fully proof-reading our work. Imagine sending a cover letter or resume to an employer that was full of spelling errors, or an email to your boss that starts “I seen you in the hallway but forgot to tell you about my terrible grammar.” Grammarly definitely can help prevent the user from feeling foolish by pointing out the errors of our typing ways before we hit send! I used this for the first time last semester to produce a video and I really liked using it! Screencastify is “mostly” intuitive, meaning I figured it out pretty much on my own (a huge adulting win for me!). Though I didn’t figure out how to turn off the webcam capture on the video I made (oops! ), I definitely saw the value in using Screencastify as a tool in the classroom! I have since used this with a few of my classes as a way for them to create “presentations” without having to get up and speak in front of the class. The students loved the freedom of creating an artifact in this manner and had fun recording themselves. This semester I plan to use it as one of the ways students can provide evidence of their thought processes and to self-assess their work. One area where I thought it might be useful is in assessing and analyzing their own work is to “talk me through” their assignment (a video of transmittal, if you like) and point out areas where they meet the specific criteria of the assignment (a thesis in an essay, for example). I also have plans to use it as a way for students to create their own content to teach to the class in an upcoming pre-AP ELA 20 assignment! Mercury Reader is something I also learned about last semester and have used a few times in the last nine months. I absolutely LOVE that it takes away the ads and distractions from online content, leaving a beautiful clean copy to read or print. When using a blog post or web-based article, Mercury Reader is absolutely the easiest and best way to get a version that is uncluttered for student use. DF Tube is another extension I learned about last semester and have used it ever since to get rid of the distractions while playing youtube videos for my classes. Please tell me I’m not the only educator that has had a perfectly harmless, appropriate video loaded and ready to show a class and on the side saw something that made me cringe, quickly block the screen from student view, and tried to recover while the class made hooting noises. DF Tube can help prevent the from happening by taking away the distracting sidebar and leaving a clean screen for viewing. I have found this one is useful at home with my twelve year old who likes to surf Youtube. With DF Tube enabled, she has to manually search for videos – genius! Make GIF is an extension I just learned about and I am going to try to hide this from our VP who likes to send daily memes … he might try to up his game to GIFs! Though I do not have many uses for this extension in my ELA classroom, I can see where it would be valuable in other learning areas, such as Communications Media. That being said, I can see where it might be fun to incorporate into ELA – for a character in a novel, students could find a video depicting the emotion or feeling they think the character is feeling and make a GIF! Though I tried to use MakeGIF on both my home and work computer, I kept getting an error code when I tried to share the GIFs I created. More playing is in order for this one. Wakelet is an extension I was excited to learn about! It allows for the saving and organizing of articles, videos, tweets, blog posts – just about anything on the web. As I experimented with it this past week, I can already see the value – it is simple to save content and access it when and where I need to! No more flash drive or using Office 365 to keep a document titled “Important Links for _________”. This could really help students who are doing research papers or assignments – their resources could be saved in Wakelet for easy access. So many of these extensions could be adapted for use in my planning, instruction, and assessment. The planning and instruction portions seem to be easier for me to wrap my head around, but there are a few of the tools that do translate well into assessment (Screencastify). The use of technology in the classroom is important for students – it is such an integral part of their daily lives and the more we teach them to use it with care and caution and with a specific purpose in mind, the better at it they will become. With the prevalence of the internet in students’ lives, it is vitally important for educators to encourage meaningful and appropriate use – digital citizenship should be explicitly taught in the classroom. Last semester in EC & I 832, we discussed this topic at length and the Screencastify video I linked earlier in this post was my views on what it means to be a digital citizen. A great resource for educators is Digitial Citizenship Education in Saskatchewan Schools. This document can help educators to become more aware of the ways in which they should promote Digital Citizenship in schools as well as outlines Ribble’s Nine Elements of Digital Citizenship. It was the first document I read in preparation for my major project in EC&I 832, which was a mini-unit I planned for ELA 20, which I link to in my reflection blog post. Web safety should be priority for our students and in order for that to become reality, educators should be aware of and plan for meaningful lessons about how to use web tools safely and effectively. Our blog challenge this week was to examine which theories of knowledge and learning underpin our teaching philosophy and classroom practice and to explore how those beliefs shifted or changed over the course of our teaching career thus far. In addition to the readings from Ertmer & Newby, Siemens, and Benjes-Small & Archer, another trip down memory lane back to my high school days is in order. Awe, 1993… the year I graduated high school. It was also the “birth” year the Internet, which was about as mind-boggling as the hair trends of the late 80s/early 90s. I learned from educators who mostly followed a Cognitivist approach, in which “[l]earning is concerned not so much with what learners do but with what they know and how they come to acquire it” (Ertmer & Newby, p.51). Memorization and retention of information was extremely important in most of my high school classes. My penchant for memorization helped me excel in my humanities classes, but not so much in maths or sciences. Because of my struggles with those courses, I was under the impression that there was something inherently wrong with my brain. How could humanities be so easy while maths and sciences were such a tremendous struggle for me? Then I had an Algebra teacher who could explain things a variety of ways and could find a way to make me connect to the content. Suddenly, I wasn’t feeling dumb anymore. In retrospect, that teacher likely employed more of a Constructive approach, where “[l]earners … build personal interpretations of the world based on individual experiences and interactions” (Ertmer & Newby, p.55). I knew from an early age that I wanted to be a teacher but I also knew that I needed to work for a while before I started University. In the four years that followed my high school graduation I worked, became a mom, met the man who would become my husband, and built up some savings. When I started University in 1997, the world was a very different place than it had been when I was in high school. People were buying cell phones (not smart phones yet!). Advertisements on TV often had web addresses to drive traffic to the Internet. Computers were in more homes and businesses. I had to learn Windows 95 and then soon came Windows 98. Trying to keep up with the ever-evolving technology was like learning a new game where the rules were constantly changing… or like Minesweeper, just waiting for an explosion! It was overwhelming at times. When I felt overwhelmed, I would call and talk with my grandma and remember all the things that she had witnessed through her lifetime (which I talked about in my previous blog post) and then I would take a deep breath and dive back in. My university profs took more of a Constructivist approach to learning as well but looking back I know that there were exceptions to that. I remember an undergrad ELA class where we were analyzing literature and all of us were pulling our hair out trying to figure out how the professor would interpret the story – he was a “my way or the highway” kind of guy. This was a huge contrast to my high school ELA teachers, who gave us the freedom to connect literature to our own lives in addition to using the historical context of the literature we were studying. Some of my experiences taught me how I did NOT want to act as a teacher and other experiences were truly amazing examples of how educators can empower students. Based on those experiences, I would say I started my teaching career based on the Constructive approach. Students are often wary when I tell them there is likely not a “correct” answer to literature analysis. This is the impetus for our discussions about how we can construct meaning from literature based not only on historical clues and context, but on our own personal experiences. Students must be connected on a personal level to be fully engaged in the curriculum so it has been my focus over my career to guide them towards those connections. My tech woes and struggles utilizing instructional technology within my classroom are punchlines for my colleagues but those struggles have been both a hindrance and a help to my growth as an educator. My students often teach me things about technology just as much if not more than I help them with their learning, and in that collaborative atmosphere we create a safe place to take risks in order to learn. That safe space to take risks is absolutely the single most valuable thing in my classroom. Life long learning truly is necessary in our ever changing world. Teaching students to respectfully disagree with others who have differing opinions, nurturing and maintaining connections, and practicing decision making will help them develop the critical thinking skills they need for life beyond our classroom walls. Our task this week was to develop a contemporary definition of educational technology and describe how our understanding of ed tech has been shaped. I would define ed tech as technology that is used to enhance or promote teaching and learning through a variety of tools and methods, varying in delivery. As for how my understanding of ed tech has been shaped, that’s a bit more complicated. By grandma’s standards, I guess you could say that I also have witnessed some astonishing changes in educational technology. Today’s students are not the same as students from 1993, the year I graduated high school. We were taught and subsequently learned using different methods than students in 2018. The mid-90s is when the Internet became “a thing” that I needed to know about and its capabilities were definitely not what they are today. My students do not know or remember a time before the Internet was readily available at the tip of their fingers. It is well known that I am not the most technologically literate person – I have to work hard to understand and incorporate technology in my daily life. How, then, am I to help my students navigate the technology jungle? I would venture to say that in my day, learning was a combination of knowledge retention and critical thinking skills. Today’s learning is more about critical thinking and application skills. I can definitely help students learn to think critically and analyze information using the educational technology tools available to us. Who could have predicted that this would become portable with so much power? Postman’s “Five Things We Need to Know About Technological Change” discusses key ideas that address some of the cautionary measures that should be addressed. Yes, technology can be fantastic for teaching and for learning, but we must also approach it with an air of caution. His first idea is that “culture always pays a price for technology.” YES. With the convenience of having our smart phones able to do so many things for us, what is being taken for granted? Face to face communication! People are forgetting how to communicate with others face to face or by phone. How many people do you know who will go out of their way to avoid making a phone call? My own daughter does this – if she can’t email or do it online, chances are she will avoid the task. As educators, we can guide students to learn how to use these communication skills, we can practice them with the use of technology, and we can promote being social instead of solitary. Postman’s second idea is that “there are always winners and losers in technological change.” Think of my grandma. She’s not interested in learning how to run a computer or a smartphone. She definitely is not going to text us from her landline or get an email address at this stage in her life. This requires us to call her or visit her in person, which is definitely NOT a bad thing. But she is not the only one whom technology is keeping powerless. Those who live in poverty and cannot afford smart phones or internet connections suffer as well. Accessibility is often something my colleagues and I must address, as not all of our students are fortunate enough to have technology at their fingertips. Sometimes I think that my resistance to technology is that I have seen firsthand that it can cause loneliness and isolation. In an era where we have knowledge at our fingertips, retaining knowledge is less valuable than it used to be. Indeed, wisdom seems to have vanished from some people completely. Postman’s fourth idea is that “Technological change is not additive; it is ecological.” His warning that we should be cautious of technological innovation is something that resonates with me. Once a technology has been introduced, there is truly no going back. We are stuck with the bad parts of it as well as the good parts. As Postman mentioned, the creation of standardized testing has changed education dramatically. It seems absolutely absurd that we would even use these tests with everything we know about the diverse abilities and ways that students learn, but they are still being widely used to categorize students and redefine curriculum. Postman’s final idea that “media tend to become mythic” is a common conception of students. Ask any teacher at a school and most of them will tell you that though “bring your own device” is great in theory, in reality it is a bit of a headache. Students (and some parents) feel that it is their right to have their cell phone at all times and that they should be able to use it in whatever capacity they want simply because they own it. Somewhere along the line they’ve lost track of the reality that they can certainly survive (and perhaps even thrive!) without having that piece of technology at their fingertips. When I taught Media Studies, we did an experiment with students – we asked them to give up their cell phones for 24 hours. The alternative to giving it up for 24 hours was giving it up for the school day – from 8:30am to 3:45pm. Many students panicked. We’re talking full blown hyperventilating, crying, and shaking. I sent a letter home to parents to inform them of the experiment. Parents also had mixed reactions. Some were furious that I would ask their kids to do such a thing! Some stated that it was a safety concern and their kids needed their cell phones so they could call in case of an emergency (insert eye roll – how did any of us survive before cell phones?). Some parents thought it was such an awesome idea that they sent their own cell phones to school with their kids to be “locked up” overnight. The experiment was a great way to remind students and their families that our reliance on technology to make us feel safe or complete is terrifying – indeed, it may even be dangerous for our health. One thing is for sure … technology is ever-evolving and we must evolve with it to some extent. My quest to find appropriate ways to use educational technology to enhance my teaching and students’ learning is ongoing.